A book can be assigned a PDF file. This is usually done when creating a new book (File – New from PDF). However, another PDF file can be selected later on at any time, from which page images can also be created by conversion (File – Use other PDF). If a PDF file is assigned to the current Mz3 book, the PDF conversion window can be opened via the menu item@Commands – Convert PDF@. The default settings usually already give good results. At the top, if the results are unsatisfactory, you can adjust some parameters that affect the quality and file size. This value determines the quality of a JPG image file. A value of 100% means that no compression takes place, so the quality is as good as possible (no artifacts). This value is only based on the setting of an image resolution! It is evaluated only by the Pdf -> SWF function. But not at every quality level of the conversion. Depending on this selection, different strategies are used when converting a PDF file to SWF files. An exact relationship is difficult to define; some empiricism is essential (try & error). *Experience with dpi: the default value of “300” often gives acceptable results. Highest quality: increase the value to 600 … 1200 and possibly more. Small file sizes: reduce the value to 100 … 150 or less. No compression, highest quality. The dpi value is not used. There is no way to do a finetuning. This setting is the best option for most applications. With the help of the dpi parameter quality and file size can be adjusted within limits. If individual pages are not converted correctly, this setting can often be successful. However, texts are also converted into image data, so that the advantage of vector fonts is lost despite the use of the SWF file. Frequently, conversion problems occur when the graphic artists have used many layers or are called “transparency layers”. By selecting the parameters of the first page to be converted and the number of pages, you can selectively convert only the problematic pages with a different Conversion Quality setting to get the best quality from the other pages. This selection does not receive vector graphics; everything is converted into bitmap data. As with bitmap 1; but even more dramatic with a higher risk of getting pixelated pages. 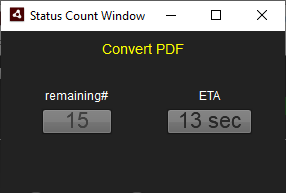 The parameters in the middle area of ​​the conversion window allow you to choose which page area of ​​a PDF file is converted. The area is defined by the number of the start page and the number of pages to be converted. *Recommendation: If you have already entered a license key, all pages will be preset for conversion. For first tests a maximum of 10 pages should be set! Depending on the page content, the conversion of many pages can take a long time and is difficult to break (the pdf2swf function runs in the background and can only be controlled to a limited extent once it has been started). !If no license key is entered or the free demo version of mz3Tool is used, a maximum of 10 pages can be converted in one call. For control and information, the maximum number of pages that can be converted is displayed. In order to save time during the conversion, already converted pages are not converted again. *If converted pages show no change of content, please activate the checkbox “Overwrite”! If this checkbox is checked, the text is extracted from the PDF file and is available as a search index. The search index is used by MegaZine to find search terms. Every page break is marked in this file (form feed) so that MegaZine can count the page breaks and knows which page the text is on. Single pages and double pages are supported. In addition, the “search” plugin is set to the plugin list so that the input field is displayed in the mz3Viewer and the Flash version. If SWF files are used, the found text passages can also be marked on the page (highlighted). If this box is checked, existing image files will be overwritten by newly converted files. If you do not want that because, e.g. only new pages are added and existing pages are unchanged, you can remove the checkmark and speed up the conversion. The lower part of the window summarizes the settings. These should be checked before starting the conversion so as not to unnecessarily wait for the end of an unwanted conversion. *If once an “endlessly long conversion job” has been started by mistake, a program abort and restart helps. If everything is set as desired, programming can be started via the Start button. A small status window will appear, showing the progress of the conversion. After the first few pages, the expected remaining time (EAT) is relatively accurate, but may vary for very different page contents. After the conversion has started, the PDF information is read and, in a first step, each PDF page is converted into a SWF file. This step is mandatory, i. SWF files are always available after conversion. In the next step, each SWF file is additionally converted into a PNG file. If all PDF pages have been converted to SWF and PNG files, the last step is to create the JPG files. After all JPG files have been created, the conversion is complete and separate pages contain all pages of the set page area as SWF, PNG and JPG pages. The final step is to close the converter window and open the Add Page Images window:https://doc.megazine3.de/mz3tool.2.4.3.11.doc/en/topic/add-page-images. The created page images (i.e., the SWF, PNG, or JPG images) now need to be assigned pages. Then the desired files are selected in the opened folder; usually all (see select page images page images}). Finally, in the opening “Assign Page Images To Pages“window:https://doc.megazine3.de/mz3tool.2.4.3.11.doc/en/topic/seitenbilder-seiten-zuweisen” window, it must be checked whether the automatic assignment of the page images to page numbers is correct, and then with” Add “ the process will be completed. *After adding the page images of the desired image type, the Mz3 book is created and displayed. The conversion is complete!